Last Sunday some witchy friends and I got together to make wands. It was a fun afternoon of good company and crafting - and I think we all found that wands are not difficult to make either. Those wands in the photo above are all mine, and all different. 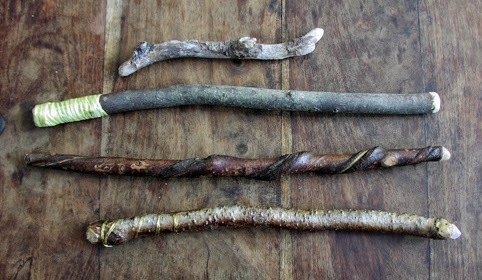 The top one is just a bit of driftwood I found on the beach and have been using as a wand for a few years; the one underneath it I made a couple of years ago from apple wood; the next one down is twisty hazel and was made and given to me by a friend; the one at the bottom is silver birch with a quartz crystal tip. That is the one I made on Sunday. At the very basic level, a wand is just a piece of wood of the right length and thickness to hold in your hand and point comfortably. You can quite easily just pick up a stick that's blown down from a tree in a storm - or washed up on a beach - and use it to cast a circle or direct magical energy in a spell or ritual. It doesn't have to be anything fancy. But, of course, it is nice to have a wand that not only looks pretty but has been crafted with specific magical purposes in mind. The first thing to think about is what tree the wood came from and what that means. In terms of magical correspondences, the Irish tree alphabet of Ogham is a good place to start. For example, apple is good for fairy magic, hazel represents wisdom and inspiration, while birch is the tree of new beginnings. If you want to go into more detail you could refer to a book such as Wood Wisdom. However, I would say it is just as important to work out your personal connection to the wood. I found that piece of driftwood at one of my favourite beaches in Sussex - somewhere I have often gone to meditate. To me it is a magical place, and I regard my driftwood wand as a gift from the sea. To shape your wand, you will need a few simple tools. A strong craft knife and sandpaper are the basic essentials, but you might need a saw for very hard wood. Cut your stick to a suitable length, prune off any little twigs, and then sand the rough bits smooth - particularly both ends and any sharp protrusions. You can leave the bark on, or strip it away. The choice is yours. Then you can decorate it to make it look nicer and to add magic. Many people like to stick a crystal to the end of their wand with strong glue. You can carve runes, Ogham or other symbols into the wood, you can tie coloured ribbons onto it or twist metal around it. Finally, I think it can look nice if you use beeswax polish to make the grain of the wood or the patterns on the bark shine out. Once your wand is made, you can start using it straight away - but many witches like to dedicate their wands first, by casting a circle and introducing the wand to the elements, the ancestors, the spirits of the place and the god or goddess they honour. Ask for their blessings that your wand will always work true magic and harm none. Note: Never cut a piece of wood from a living tree without asking permission - both from the owner of the tree and the tree itself.